Girl group Twice topped the charts again on the local music show “Inkigayo,” even without making an appearance. 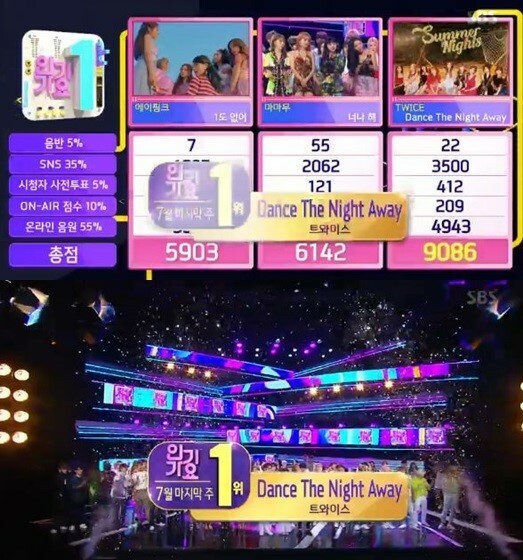 This is the group’s sixth win on a music show. Promotional activities for the song ended last Sunday, but the group’s popularity at home and abroad remains high. Twice faced strong competition this week as it went against two other well-known girl groups, Mamamoo and Apink, who are actively promoting their singles “Egoistic” and “I’m So Sick,” respectively. Mamamoo ranked second and Apink followed in third place on the “Inkigayo” charts Sunday.